For those who love the idea of the great outdoors and are inspired by great design, Lakani World Tours can take you to visit Scandinavia and all that it has to offer. Plan to visit Denmark, Sweden, Norway and/or Finland. Travel by plane, car, ferry or even dog sled to visit this amazingly beautiful area of the world. While the weather may be preferred in the summer, there is adventure to be enjoyed in the winter as well. Your adventure may begin or end at any given point but might well begin in Helsinki, Finland where you will see and visit Esplanade Park, Market Square, Senate Square, Parliament, and a variety of museums. Copenhagen, Denmark is a sophisticated capital city that offers some of the most magical sightseeing. Here you will see the Little Mermaid, the Royal Palace and visit Rosenborg Castle and Tivoli Gardens. From Copenhagen you can visit North Sealand and Viking Land. Take the ferry to Stockholm, Sweden where you will visit the Vasa Museum, the Royal Palace, the Gamla Stan and the Skansen Open-Air Museum. You might venture from the capital to Gothenburg and Malmö. Continue on to Norway and its capital of Oslo where you can visit Frogner Park, the Viking Ship Museum and Munch Museum. End your journey in Bergen and point north in the spectacular scenery of the fjords. Shop for high fashion and interior and household items with the latest design trends. We will create a custom itinerary based on your travel dates and preferences. 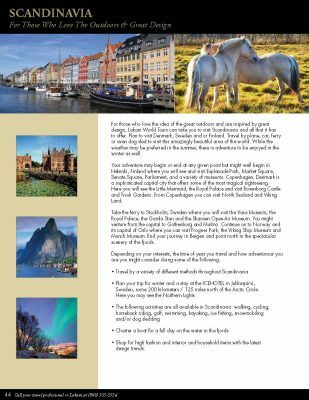 Scandinavia itineraries can focus on one country, combine capital cities or a combination of cities in some or all countries of the region.